Package: 10ml vial (50 mg/ml). The anabolic steroid MethateX Injection has a very strong androgenic and anabolic affect which manifests itself in an enormous build up of strength and muscle mass. Dianabol is simply a mass building steroid that works quickly and reliably. A weight gain of 1 - 2 kg (2-4 pounds) per week in the first six weeks is normal with dianabol. 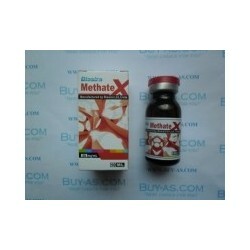 Methandienone Injection, often called and known as Dianabol, is one of the strongest anabolic steroids that there is. With Methandienone injections you can gain 1-2 kg (2-4 pounds) per week easy in first 6 weeks. It is one of the oldest anabolic steroid on the market. It was very popular amongst top olimpic champions in the 60 ties an 70 ties. It was called "The breakfast of the Champions". Dianabol became the most used anabolic steroid. Dianabol has great effect on protein synthesis that manifests itself in a positive nitrogen balance. Methandienone aka Dianabol, effects calcium deposits in the bones and has a strengthening affect on the entire organism. For those who look for raw mass, power and endurance, Dianabol, especialy in injection form (In tablet form very popular name is Anabol or Methandienon) is great choice. But you must be beware that Dianabol aromatize quickly, so anti estrogen like provision or Tamoxifene Citrate must be used. In the end of the cycle Clomifene Citrate must be used to preserve mass and to help boosting level of natural testosterone. Essentiale forte is also recommended in the end of the cycle because Dianabol effect liver values, but few weeks after finish of your cycle, it will normalize quickly especially with little help from Essential Forte. Dianabol can stacked with any anabolic steroid. We recommend Deca Durabolin and/or Testosteron suspension. You will be amazed with results. You can gain up to 20 kg (10 pounds) in 8 weeks easy. Just don't forget that nutritions are the most important part!! You must have 2-3g per kg and 6-8g per kg of carbs daily.